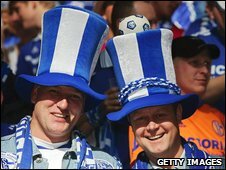 BBC NEWS | UK | Magazine | What makes a man wear a hat? What makes a man wear a hat? Hugh Jackman has been named celebrity hat wearer of the year, but it wasn't long ago that hats were part of every self-respecting man's daily attire. What leads a man to wear a hat today? "It was the motorcar. 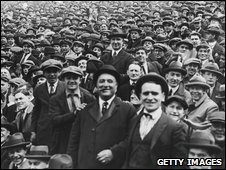 Before cars became common they were a useful item of clothing to keep the weather off," says Christine Smith, manager of the Hat Works hat museum in Stockport, Greater Manchester. "And it was a status symbol - you had the bowler hat and the flat cap. It showed your place in the hierarchy." "The younger generation had longer hair and that stopped them wanting to wear hats as much," he says. "People were also getting more affluent - they were buying cars, and weren't needing to wear hats." "There is this myth that John F Kennedy went to his inauguration in 1960 without a hat. Actually he did, but he didn't wear it during the ceremony. "Generally if you look at the history of menswear, in the last 100 years it's been a gradual progression from formal to casual wear. The jacket has gone from a military frock coat to the jacket of a lounge suit, the shirt has gone from something with stiff studded collars to a fold down collar, and the formal, handmade shoe has been replaced, in some cases, with trainers. "Nowadays the expectation we have is that the things we wear will be comfortable. And the formal hat fell victim to that general trend." So has the modern man turned his back on the fedora et al? Is hat wearing - other than a woolly one when the mercury plummets - merely an affectation? "The last three or four years we have seen our sales rise by about 30%," he says. "A lot of customers are tending to go in for things like the narrow-band trilby, or the Gatsby cap, which is still very popular." Dave Swan, 40, a graphic designer from London, started regularly wearing a hat about a year ago. "I've pretty much always worn some sort of head gear off and on but I suddenly became interested in Baker Boys [a kind of Gatsby cap] about a year ago, since then they've been all I've worn." Mr Swan says it is partly about personal style, but also "there's an element of a psychological safety blanket as well, the more you cover your head the more of a wall you build up from the rest of society". Ollie Thomas, 25, a publicist, often wears a hat to work. He says they can be "anything from beanies to bobbles to flat caps to Cubans". "When I am in the office I prefer to wear a more traditional flat cap as opposed to weekend when I would wear a beanie." He says he also likes the link with tradition, "especially with my tweed flat caps". "They can also be seen as stylish as well, so you can kill two birds with one stone." "They are wearing a lot of hats - beanies and baseball caps and flat caps. And they're doing it a lot more than they were 10 years ago. To them it's a fashion thing. 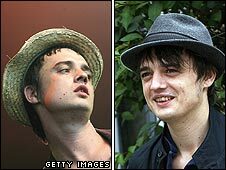 "My teenage son wears a hat all the time - it'll be interesting to see if he still is in 10 years time." In his first job after the Second World War, my father was requested to acquire a hat to wear to and from work. What puzzles me is the number of period dramas made recently where few, if any of the male characters wear hats. This also applied to a Doctor Who episode set in 1913 - not a hat in sight, except for some of the women. I wear hats everyday and own over 30 fedoras/trilbys, mostly vintage. I love them, not just because I think they look good, but because they keep me warm in the colder months and shaded during the warmer months. There seems to be many more places to buy modern ones these days, but they're mostly made of wool and the style isn't quite there for me, which why I typically scour the internet and vintage shops for them. I take my hat off to you for this article. I've complained for a long time about the lack of hat racks at eateries and other establishments. In Texas, the iconic cowboy hat is also losing ground. In my youth, every restaurant had a hat rack next to the table or a hat check at the entrance. No more. I don't wear a hat on a regular basis - but my Stetson is in the closet at home. Of course, there are my ball caps, which I have dozens of, which I wear for casual wear and to keep the sun out of my eyes when I'm driving or flying. In addition to hats, it is notable, too, that most men wore shirts, slacks and even jackets to the beach, sporting events and even "casual" gatherings such as picnics, etc. I for one, mourn the loss of the chapeau. But the world changes. I wear a hat to keep the sun off my bald head. Those fortunate people who have hair are unlikely to wear a hat because it'll interfere with or hide their expensive hair-do or hair-gelled creativity. Among men, hair is more of a fashion statement than it used to be. Women's hair fashion has also changed, but from one where hair was held rigidly in place with huge quantities of lacquer - which allowed a small hat to be pinned on top - to one where silky, free-flowing hair with highlights predominates. Other than Ascot, when was the last time you saw a women under retirement age wear a hat? It is all to do with hair. My father was a young man in the 50s, and like most working class men of the time sported an Elvis quiff or a DA. There was no way he was going to ruin that with a hat. 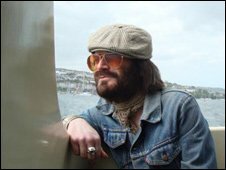 I grew up in the 70s when long hair on a man was de rigeur. Punks cut it strangely but it was still long. Then there was the mullet look of the 80s. Now that head stubble is in fashion they have started wearing hats again. They even wear them indoors and in cars. The only people who did that when I was growing up were the members of the Jewish community. My gloriously long hair has been replaced by baldness but I am in the habit of not wearing a hat, except to keep off the weather. I think that these two generations were the exceptions. People always wore hats until James Dean and Elvis said they were uncool and from now on people will continue to wear hats, even if they are just those rather sad baseball caps. I've been a hat wearer as long as I can remember. My Dad, a plainclothes police officer never went to work without his fedora and always from Cavanaghs (a hat shop on 57th street in Manhattan). I still own two Cavanagh fedoras (very out of style), had owned two Borsalino fedoras (purchased at a time all US Naval officers were required to wear fedoras when on liberty and overseas), own three baseball caps from NewEra, one from RomanPro (out of business), have a Tilley, a gardening hat purchased at Longwood Gardens (world renowned), multi wool caps for winter, an Irish walking cap, several Kangaroos, many gold hats of straw and other materials, and a rain hat I purchased at Yosemite National Park. I love my hats and would have more if I could find a fit (almost an American size 8). Thanks again for thinking of me. I own a hat shop in Yorkshire which sells both gents and ladies. I've noticed men come into one of two categories - the younger customer who uses the hat for image or as part of the clubbing scene garb (usually Bowlers for clubbing or the skinny brimmed Trilby for the festival goers). The second type of customer is the gent with the receding hairline who needs UV protection in summer and to keep warm in the winter. I've been reliably informed at The Retail Trade Shows this year that mens hats are going to be really "big" this Autumn/Winter 09/10. I lament the demise of the hat. I often wear more formal hats depending on the weather and situation. I started off with a Panama about 5-6 years ago and have slowly been building up my collection ever since. I was bought a beautiful fur felt Trilby about a year ago which was recently joined by a Bowler, which I love to wear in the colder months. I also have a couple of Stetsons and a (rather stereotypical) Red Army Cossack. I'm 28 years old and think the look of a young(ish) man in a hat often inspires people to say a friendly hello in the street.